Mitzo Restaurant & Bar redefines the Chinese dining experience by uniquely combining a contemporary take on Cantonese cuisine with an eclectic mix of imaginative cocktails. With a design aesthetic that is both dramatic and modern; Mitzo offers diners an unparalleled dining experience. 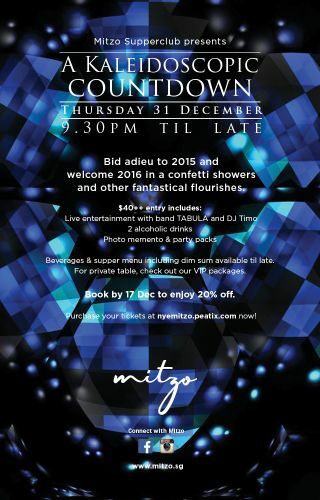 This year, bid farewell to 2015 and welcome in 2016 with confetti showers at Mitzo, with special guest performances by TABULA and DJ Timo, coupled with Mitzo’s inventive cocktails and array of Cantonese food selections. Tickets start at $40++, with private tables and VIP packages available, with an ongoing promotion of 20% off should you purchase before 17 December.